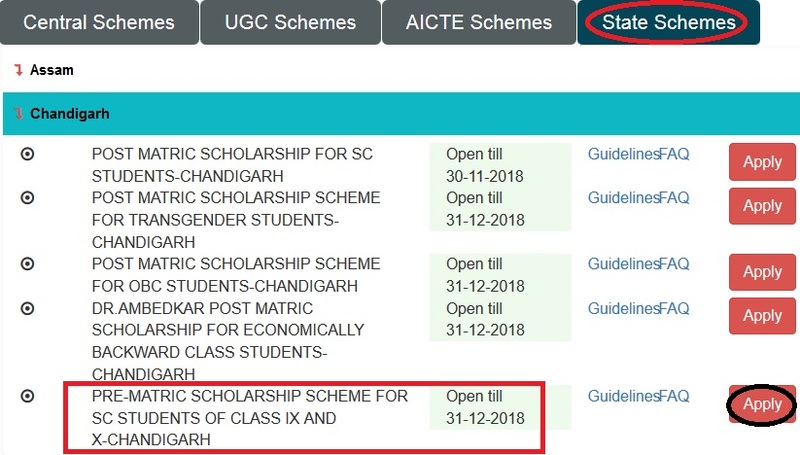 Pre-Matric Scholarship Scheme For SC Students Of Class IX & X Chandigarh for the year 2018-19. To support parents of SC children for education of their wards studying in class 9th and 10th so that the incidence of drop-out, especially in the transition from the elementary to the secondary stage is minimized, and to improve participation of SC children in Classes 9th and 10th of the pre-matric stage, so that they perform better and have a better change of progressing to the post-matric stage of education. ** Students should belong to scheduled Caste. ** His/her parent/Guardian’s income not exceed Rs. 2.50 Lakh per annum. ** Scholarship for studying in any class will be available for only one year. If a student has repeat a class, she/he would not get scholarship for that class for second (or Subsequent) year. Just follow the below steps to apply for the Pre-Matric Scholarship To SC Students Of Class IX & X 2018-19. Step 3 : After that Click Apply link in the “Pre-Matric Scholarship To SC Students Of Class IX & X ” under Chandigarh. ** Income declaration of self employed parents/guardian should be in the form of a certificate issued by Revenue officer not below rank of Tehsildar. ** Employed parents/guardians are required to obtain income certificate from their employer Employed parents/ guardians should obtain consolidated certificate from Revenue officer for any other additional source of income He/she should be regular, full time students studying in a Government school or in school recognized by Govt. or a Central/State Board of Secondary Education. I am from Jagabandhu High School, Sasanda. I want the selected candidates list of SC students scholarship 2017-18.